Often these days Catholics will dismiss discussions regarding the reform of the liturgy as being largely irrelevant. Topics such as the reception of Holy Communion and the use of Latin are viewed as divisive and unnecessary to broach. Despite the constant teaching and liturgical example provided by Pope Benedict XVI during his papacy, many still believe that matters regarding liturgical disciplines simply reflect personal preference and nothing more. After all, they say, as long as the Mass is valid…who cares? The Catholic Mass was celebrated in Latin; the Protestant Lord’s Supper in English. Much of the Mass was celebrated in an inaudible tone; the Lord’s Supper was spoken audibly throughout. The Mass began with the Psalm Judica me, in which the priest stated specifically that he was going unto the altar of God, and ended with the sublime Last Gospel; in the Lord’s Supper the Judica me and the Last Gospel and many traditional prayers were abolished, particularly the sacrificial Offertory Prayers. The Mass was celebrated on a sacrificial altar facing the East; the Lord’s Supper was celebrated on a table facing the people. In the Mass, Holy Communion was placed on the tongue of the communicant by the anointed hand of a priest; in the Lord’s Supper it was placed in the hand of the communicant. In the Mass, Holy Communion was given to the laity under one kind only; in the Lord’s Supper it was always administered under both kinds. (The Catholic Sanctuary, pp. 15-16). Those who sought liturgical revolution over four hundred years ago knew that theology and liturgy are interdependent. Want to attack the Church, the ministerial priesthood and belief in the Real Presence itself? Destroy the Mass. Remove the Sacrifice of Calvary (offered by a priest) and instead gather the faithful together for a commemoration of the Lord’s Supper (led by a presider). Breaking it down further, Davies expands upon the theological implications behind several major liturgical changes introduced by Protestants at the time of the Reformation. “The sublime Latin prayers of the traditional Mass, which dated back to the sixth century and beyond, into the mists of antiquity, were replaced by an English service from which every specifically sacrificial prayer had been removed. 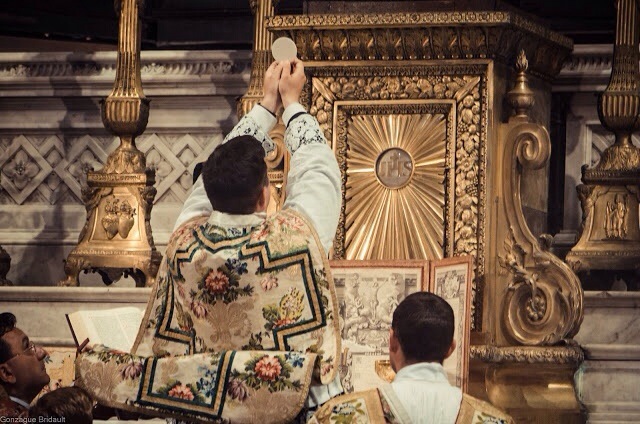 Because the Mass is a solemn sacrifice offered to God by the priest in the person of Christ, many of the prayers—addressed directly to God—had been spoken inaudibly. The Protestant Lord’s Supper was not a mystical sacrifice, a mystery, but a meal and a service of prayers and instruction, so it was mandated that every word spoken was to be heard by all the people.” (Ibid., p. 12). “Communion on the tongue was replaced by Communion in the hand to make it clear that the bread received was ordinary bread and that the minister who distributed it was an ordinary man, not a priest.” (Ibid., pp. 12-13). “Communion under one kind was replaced by Communion under both kinds, because in every meal there should be both food and drink.” (Ibid., p. 13). “Above all, the never-to-be-sufficiently-execrated eastward position of the celebrant at Mass was to be abandoned forever.” (Ibid., p. 13). Few can’t help but look back at these 16th century Protestant innovations and not think of the liturgical “reforms” introduced in the post-conciliar Church: the stripping of Latin from the liturgy, the incessant push for communion in the hand, the introduction of Extraordinary Ministers of Holy Communion and the nearly exclusive practice of offering Mass facing the people. What’s most troubling is that none of these practices were mandated by the Second Vatican Council. They were, however, all integral pieces of the liturgical revolution sought by those representing the “spirit” of the Council. As a result, many Catholics today are much more at home at a Protestant worship service than they are at the Traditional Latin Mass. Change how we pray and you will change what we believe. It is as true today as it was four hundred years ago. As faithful Catholics, is there anything more important that we should be discussing than this?